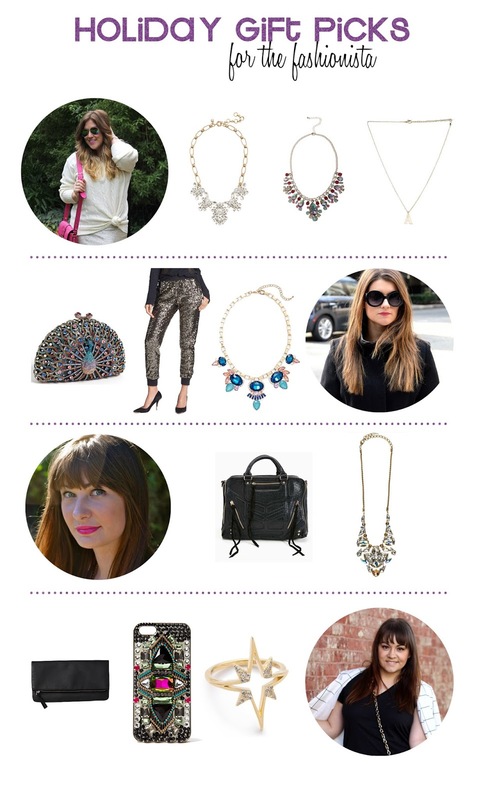 I'm pleased to announce that I've teamed up with three blogger babes, Amanda of Fashionablee Me, Jen of House of Jeffers, and Mollie of Mollie in Seattle, to bring you a weekly holiday gift guide for the 2013 holiday season! Each week we'll share our picks for a different person on your list. Up first is gifts for the Fashionista! Read on to see what gifts we suggestion for the stylish gal on your list! When it comes to the perfect gift for your fashionista friend, I love the idea of a fabulous necklace at an affordable price! Whether your friend is subtle and classic or super glam, these necklaces are great for any fashion-loving gal. The dainty initial necklace (for only $14.00!) brings a personal touch while being super on trend. And these statement necklaces are perfect for all the holiday parties coming up... and more! This satchel doesn't break the bank, but definitely has character with its layered, cut-out design. And, for $65, it leaves room in your wallet to buy more nail polish stocking stuffers! Love this Sorrelli necklace because who doesn't need a sparkly statement necklace. A clutch is an essential must have piece for the fashion loving person, one that sparkles is even better! Nothing says happy holidays like a pair of sequin pants. They're thoughtful and fun and perfect for taking outfit pictures. A necklace is a terrific gift option, it's something special to wear and bound to inspire outfits and admirers. I like picking out accessories for my fashion-minded friends because, for the most part, you don't have to worry too much about picking out the right size. This basic black clutch gets a twist by adding a little fold-over detail. With the right outfit, this budget-friendly handbag will look like you paid designer prices. An easy way to add a bit of glam to your friend's every day is to dress up the item they always have on hand--their phone. This over-the-top bejeweled phone case is just the piece for the job. But making a fashion statement can also be as easy as slipping on a simple, clean ring. This gold star ring will make a statement without overpowering the look. Great picks, especially that peacock clutch....I want it.